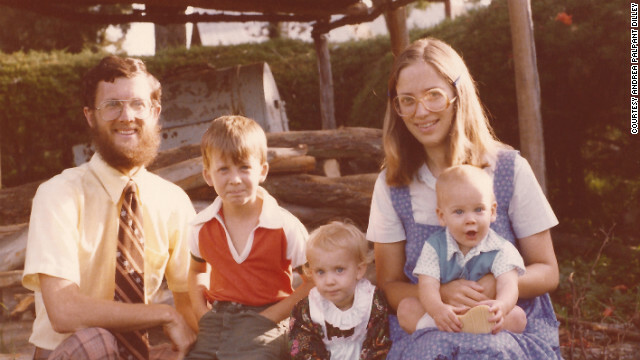 Andrea Palpant Dilley as a child with her missionary family Kenya. During my junior year in college, I took a butter knife from my mother’s kitchen and scraped the Christian fish decal off the back bumper of the Plymouth hatchback I’d inherited from my older brother. Stripping off that sticker foreshadowed the day, a few years later, that I would walk out of church. The reasons for my discontent were complicated. By most standards, I had a healthy childhood. I grew up the daughter of Quaker missionaries in a rural Kenyan community that laid the foundation for my faith. I spent the rest of my childhood in the Pacific Northwest, raised in a stable Presbyterian church that gave me hymns and mission trips and potluck dinners. I was surrounded by smart, conscientious Christians, the kind of people who read 19th century Russian novels and took meatloaf to firefighters when much of eastern Washington state went up in flames in the fall of 1991. When I started into my skeptic phase, my Christian community gave me space to struggle. They listened to my doubts about faith. They took my questions seriously. And yet when I turned 23 I left the church. These questions didn’t come out of nowhere. I’d spent time in high school volunteering in refugee camps in Kenya and in college working with families on welfare in central Washington. I saw hungry babies. I walked into homes that were piled with garbage and dirty laundry. In an orphanage in the slums of Nairobi, I held AIDS babies and worked with disabled kids who’d been left at the front gates of the orphanage by parents who couldn’t afford to feed them. I saw things that I couldn’t make sense of as a Christian. Step 1: Grow up in a Christian church. Step 2: Go off to college away from said church. Step 3: Be exposed to the enticements of secular life. Step 4: Try drugs and cigarettes and Pearl Jam. Step 5: Leave the church because of aforementioned enticements. Step 6: Experience epiphany; realize vapidness of secular enticements. Step 7: Return to church with penitent heart. Step 8: Reestablish faith, discover good living. The opinions expressed in this commentary are solely those of Andrea Palpant Dilley. I was not born a Christian but accepted the Lord in my youth (in a secular socierty SIngapore). I have believed for 30 years. I will be honest: Not everything that sermons say are correct. Last years, i heard a preacher said that if you are close to God, you will know what to pray and He will say yes. That is not true either. EVERYONE, although one accepts jc, and many have for over 2000 years now, and yet there is still much suffering today, does to anyone this seem to be a vicious cycle going nowhere? It was prophesied in Daniel 11:39, that this generation will be ruled by strange gods the 'fathers' Knew not; which were brought by forces, to profit, to gain. Well, this is that new generation confirmed in Daniel 2:40, of the 4th kingdom, this is us today folks; we are serving not the true Savior, and Redeemer, who is YHWH, His true name. Look under tetragrammaton in the back of most KJV books, ep. The 1611, you will see that the words, Lord, God replaces YHWH, His true Hebrew name, as depicted in Exodus 3:18, they replaced THE TRUE NAME YHWH, over 6800 times. YHWH IS OUR ONLY SAVIOR, AND REDEEMER, TAUGHT TO US IN ISAIAH 49:26, ISAIAH 60:16, AND in ISAIAH 43:3,11,15; NO MAN CAN BE DELIVERED FROM HIS HANDS, DEUTERONOMY 32:39, AND SAID IN MANY MORE SCRIPTURES IN THE SO CALLED OT, which also should be called 'the book of remembrance' taught in Malachi 3:16. Doing other gods is why we still have mayhem, and suffering on this earth today, for YHWH teaches us that the shepherds are not teaching His word to the flocks the right way, they lie to the flocks, in Ezekiel 34. YHWH will address this in His day, prophesied in the book of Joel, and for the controversy over in the holy land as well, Israel, Zion, in Isaiah 34:8. His righteousness is nearing, in Isaiah 51:5. To add, the only son, and firstborn YHWH says He has is in Exodus 4:22, this does not say jc, AND YOU CAN'T HAVE TWO FIRSTBORNS RIGHT? This is why the woman in this column writing is so dismayed, and confused with the church. Something is not right, because it is not. YHWH BLESS, all praise is to go to the creator of All 'Life' the ALMIGHTY YHWH. DEUTERONOMY 5, SAYS WE MUST READ THIS BOOK FROM GENESIS-MALACHI TO GET THE TRUTH FROM THE BEGINNING OF THIS BOOK, THE NT 'MUST' FULFILL THE SO CALLED OT. Ms. Lorraine, that doesn't work because angels were refered to as the "sons of God" in Genesis when they slept with the daughters of men and had superhero babies. Also Isaiah 52 and 53 clearly are not talking about a group of people but one person. Jesus was there with YHWH in the beginning, as Elohim is plural. Jesus does not claim primacy before YHWH. I've never met a Jewish person who articulated their beliefs from scripture, please continue to do so as there is much misunderstanding. Nothing like an average Joe Christian re-writing the OT. LOL. John 3:16-"For God so loved the world that he slept with Mary against her will, that whoever believes him to be a bast ard shall not perish but have eternal life." I don't know about back to "church", but I do know we need to get back with God. Many try to find in "church" a relationship with God, one which they should have already apart from "church". One needs to receive Jesus as their Lord and Savior first. This removes the barrier that seperates us from God which is sin. Once we have asked God to forgive our sins through faith in Jesus and His finished work on our behalf, then we will satisfy that spiritual hunger that "church" can never satisfy. Today, I think the true Church is going underground out of necesity, since many churches are very corrupt and have compromised the Word of God and brought in the doctrines and traditions of men, and of the world. Recieve Jesus, and you will know His peace. Barry, although one accepts jc, and many have for over 2000years now, and yet there is still much sufferings today,does to anyone this seem to be a visious cycle going nowhere? It was prop hesied in Daniel 11:39, that this generation will ruled by strange gods the 'fathers' new not; which were brought by forces, to profit, to gain. Well, this is that new generation confirmed in Daniel 2:49, of the 4th kingdom, this is us today folks, we are serving not the true Savior, and Redeemer, who is YHWH, His true name. Look under tetragrammaton in the back of most KJV books, ep. the 1611, you will see that the words, Lord,God replaces His true Hebrew name, as depicted in Exodus 3:18, they replaced it over 6800 times. YHWH IS OUR ONLY SAVIOR, AND REDEEMER, TAUGHT TO US IN ISAIAH 49:60, ISAIAH 60:16, AND in ISAIAH 43:3,11,15; NO MAN CAN BE DELIVERED FROM HIS HANDS, DEUTERONOMY 32:39, AND SAID IN MANY MORE SCRIPTURES IN THE SO CALLED OT, also should be called 'the book of remembrance' taught in Malachi 3:16. Doing other gods is why we still have mayhem, and suffering on this earth today, for YHWH teaches us that the shepherds are not teaching His word to the flocks the right way, they lie to the flocks, in Ezekiel 34. YHWH will address this in His day, prophesied in the book of Joel, and for the controversy over in the holy land as well, Israel, Zion, in Isaiah 34:8. His righteousness is nearing, in Isaiah 51:5. To add, the only son, and firstborn YHWH says He has is in Exodus 4:22, this does not say jc. Barry, CORRECTION: ISAIAH 49:26, YHWH IS THE ONLY SAVIOR, AND REDEEMER WE HAVE. THERE IS NO ONE WITH HIM IN DEUTERONOMY 32;39. "My doubt is actually part of my faith."??? what senseless tripe. but whatever makes you feel all warm and fuzzy i suppose. grow up and face the reality that life is not all what you want it to be. like you wanted some freedom and were upset that your sky daddy didn't approve. you never left. Atheism is Great for Kids and Grown-Ups Too! It's really best for all people including children to have an agnostic approach to god, and an atheistic approach to all religion. It keeps things simple for kids, and lets them be all that they can be. They just need to be taught that some things, like all religion, were just made up by salesmen and politicians from long ago**; and that other things, like god, we really don't know a damn thing about. Atheists have strong minds and don't need a religion. Sometimes, religious folk run and hide their misdeeds within their religion (and by doing so, they disserve society). Sometimes, religious folk are easily offended when someone mocks their make-believe characters – and, as we can see they can get really CRAZY! Religions are just big old evil clubs – each trying to out do each other and inspiring hate and division along the way (disguised as love). So instead of praying to make-believe people, get a good cup of tea and go on and sit down and collect your damn thoughts. My goodness. As I understand it, Moses went up the mountain to see God. Upon his return he found that his people were worshiping a golden calf. Where did they get the gold? Is it possible that they stole it from their Egyptian masters? If so is it possible that the Egyptians in pursuit were merely trying to capture the thieves who stole the gold? 2 Aaron answered them, “Take off the gold earrings that your wives, your sons and your daughters are wearing, and bring them to me.” 3 So all the people took off their earrings and brought them to Aaron. 4 He took what they handed him and made it into an idol cast in the shape of a calf, fashioning it with a tool. You cant take the book of exodus literately, it was written during the babylonian exile, based on oral traditions of the jewish people, the events described are myth, but not myth as we understand it in english, it was an attempt to explain something that happened in language everybody would understand. There was most likely several small exoduses. This isn't proof that God had nothing to do with it, its just that the book needs to be read with a clear understanding of context. Would you debate with someone who argues that the sky is yellow, up is down, left is right, a tree is a lamp, or black is white? You debating with this person would leave both parties looking like fools. Christians please stop wasting your time on people who argue that our world and galaxy was made from nothing/has no Creator. I honestly believe that many years ago no one predicted that the world would get bad to the point that people are debating that this perfect system of life is a coincidence. Christians dont indulge in foolishness. Romans 1:20-"For since the creation of the world His invisible attributes, His eternal power and divine nature, have been clearly seen, being understood through what has been made, so that they are without excuse." John 3:16-"For God so loved the world that he gave his one and only Son, that whoever believes in him shall not perish but have eternal life." John 3:16-"For God so loved the world that he slept with Mary against her will, that whoever believes him to be a bast ard shall not perish but have eternal life.". Perfect system of life? Have you been outside of this great country? Have you seen women being beheaded by their Taliban husbands, children starving, babies left in buckets on the side of the road, death and starvation and injustice everywhere..... Where is this perfect world you speak of? Misled, although one accepts jc, and many have for over 2000 years now, and yet there is still much suffering today, does to anyone this seem to be a vicious cycle going nowhere? It was prophesied in Daniel 11:39, that this generation will be ruled by strange gods the 'fathers' new not; which were brought by forces, to profit, to gain. Well, this is that new generation confirmed in Daniel 2:49, of the 4th kingdom, this is us today folks; we are serving not the true Savior, and Redeemer, who is YHWH, His true name. Look under tetragrammaton in the back of most KJV books, ep. The 1611, you will see that the words, Lord, God replaces YHWH, His true Hebrew name, as depicted in Exodus 3:18, they replaced it over 6800 times. YHWH IS OUR ONLY SAVIOR, AND REDEEMER, TAUGHT TO US IN ISAIAH 49:60, ISAIAH 60:16, AND in ISAIAH 43:3,11,15; NO MAN CAN BE DELIVERED FROM HIS HANDS, DEUTERONOMY 32:39, AND SAID IN MANY MORE SCRIPTURES IN THE SO CALLED OT, which also should be called 'the book of remembrance' taught in Malachi 3:16. CORRECTION: ISAIAH 49:26, OF OUR SAVIOR, AND REDEEMER IT'S YHWH. An Atheist is simply a person that has not met God yet. Many atheists have met "god", and then later realized he was a figment of humanities imagination. I grew up in the Catholic tradition, Catholic schools, Catholic ceremonies such as confession, confirmations, weddings etc. But as an adult I don't go to church. I don't accept any one religion's explanation of everything. And I absolutely accept science as far as it currently takes us, and am certainly turned off by religion when it disagrees with a scientific discovery that calls its dogma into question. If I ever decide to take my young kids to church it will only be to let them know what culture / tradition they come from and to keep them away from fundamentalists and Scientology for example. Should it give them a sense of community then that's fine too. theres things they don't tell you in church, like did Jesus say on the cross to the thief..Today you will be with me or...today i tell you, you will be with me. But how could he be with him in paradise when it is a fact Jesus went down into hell and then rose from the dead, he didn't go up into heaven, cause he said in the garden to mary "stop clinging to me i haven't ascended" and he had the appearance of someone who had been beaten up...for 40 days he was like that because thomas could see the wounds in Jesus side and hands, he is still scarred. Just thought i'd say that. One must take into consideration that Jesus, was both fully God and fully man, to try to answer the question that Jesus said to the thief on the cross beside Him, "today, you will be with in paradise." I say this, that though Christ hadn't ascended, but would ascend later, the thief would still go to be with God in paradise, and since Jesus was not only man but God as well, Jesus kept His word to the thief. Please take this into consideration, I do not offer this comment as a means to say I'm right and your wrong, but to try to offer an explanation of why Christs word were true. FALSE GLORY! Says The Lord in His jealousy. For their works are perverse in My sight, and their words contemptible. Therefore, because they have robbed Me, I will rob them. I will tear them in pieces, with every foundation collapsing... No wall shall be left standing... And they shall become as those, whom they have forsaken. And they shall no more preach from their finely-crafted pulpits, standing tall among all their expensive ornaments, broadcasting lies with all their purchased devices. Neither shall they pollute My name, anymore! 7 – Your face turns purple when you hear of the "atrocities" attributed to Allah, but you don't even flinch when hearing about how God/Jehovah slaughtered all the babies of Egypt in "Exodus" and ordered the elimination of entire ethnic groups in "Joshua" including women, children, and trees! 3 – While modern science, history, geology, biology, and physics have failed to convince you otherwise, some idiot rolling around on the floor speaking in "tongues" may be all the evidence you need to "prove" Christianity. Only reason you're an atheist – denial. Only reason you are a theist, ignroance. Wow. You're really smart. I hope God is impressed with your reasoning when you stand before Him on judment day and tell Him all about why you don't believe in Him.